The Dutch L’Oréal - UNESCO For Women in Science Fellowship were awarded today during an official award ceremony at the Koninklijke Hollandsche Maatschappij der Wetenschappen. 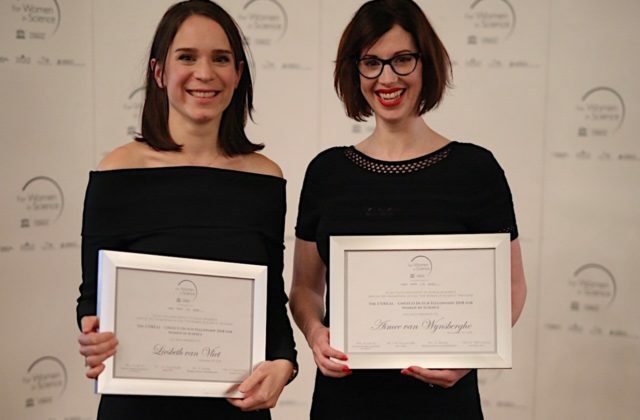 The two fellowships at NIAS, each worth 25.000 euro, were awarded to life scientists Aimee van Wynsberghe (NIVEL) and Liesbeth van Vliet (TU Delft). Liesbeth van Vliet (1985) aims to improve outcome for seriously ill patients and help their loved ones through a better understanding of how communication can hurt as well as heal. She studies how communication and the provision of information for those with serious illnesses (e.g. advanced cancer) can actually hurt, and how such negative effects (i.e. nocebo-effects) could be minimized. Nocebo-effects refer to the negative effects of the context in which care is provided (e.g. the clinician’s explanation) rather than the medical-technical intervention (e.g. treatment’s active ingredients). By integrating research on communication with nocebo-effects, Van Vliet hopes to understand more about how to improve patient outcomes. Aimee van Wynsberghe (1981) aims to explore the ethical significance of touch between humans and robots. Robots that can touch will change how we sense the world, in the same way that visual technologies have changed how we see the world. The robots of 2018 interact and even cooperate with humans in factory, professional, and personal settings which results in instances where humans and robots will touch. Research in the field of tactile human-robot interaction explores the safety and security issues associated with situations in which humans and robots come into physical contact. Up to now there has been a lack, both in terms of quantity and quality, of discussions that explore the human sensory experience of interacting with robots. Van Wynsberghe aims to fill this gap in the robot-ethics literature and will lay the foundations for an ethics of human-robot touch and provide recommendations for the designers and roboticists who build robots that touch and are touched. The prestigious international ‘For Women in Science’ programme is a collaboration between UNESCO and L’Oréal with the tagline: ‘The world needs science, science needs women’. The programme awards fellowships and prizes to exceptional female scientists in the field of life sciences. Since 1998, more than 3100 women from 117 countries have received a fellowship or award. The Dutch ‘For Women in Science’ fellowship was introduced in March 2012 by the Netherlands Commission for UNESCO and L’Oréal Netherlands in partnership with the Netherlands Institute for Advanced Study (NIAS) and the Dutch Network of Women Professors LNVH. Annually two fellowships, with a maximum €25.000 are awarded to women scientists who conduct research in life sciences. The grants are intended to advance the academic careers of women researchers with 3-10 years of post-PhD academic experience and offer women researchers the opportunity to work within the interdisciplinary, international academic environment at NIAS in Amsterdam, away from the distractions of regular administrative and teaching tasks so that they can focus on broadening their research and writing publications or grant proposals. The “For Women in Science’ programme aims to help women progress in their scientific careers and contribute to an increase in the number of female professors in The Netherlands.